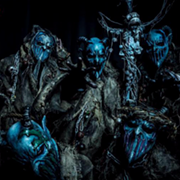 We're still more than two weeks away from Mushroomhead's annual Old-School Christmas show at Peabody's. But fans can prep by pulling out their favorite cow-head mask and logging on to The Rave Live tomorrow night. The website will stream the Cleveland band's concert at the Rave in Milwaukee at 8 p.m.
And yes, it's a video stream, so you'll be able to see the guys in all of their visual glory. 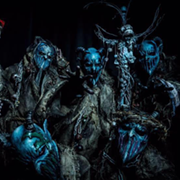 Mushroomhead are still touring last year's Beautiful Stories for Ugly Children album, so expect a set heavier on new tunes, unlike the show here on December 30, which will dip into the band's 20-year history. From that start time, we're guessing openers One Eyed Doll and Tenafly Viper will also be part of the webcast.